"When the world is imperiled. When evil surrounds you. When danger is lurking. Who do you call?" "Captain Excellent." Those are words you would expect to come from a real superhero and a young kid. In Paper Man, that is not the case. The superhero is imaginary, and comes in the form of Ryan Reynolds as a man who wears his undies on the outside. The imaginer of the superhero is in fact a grown man, failing writer Richard Dunn (Jeff Daniels). What happens when the grown man gets a real friend (Emma Stone) with some problems of her own? He gets some lessons on how to grow up, even if his long-suffering wife (Lisa Kudrow) and Captain Excellent disapprove. Paper Man houses a very interesting sort of story which sees it's protagonist dealing with leaving his past behind--his past being an imaginary friend. In some ways, it succeeds in being a charming, coming-of-age-of-sorts. But the movie takes the focus too much off Richard's relationship with Captain Excellent and puts it on the relationship he forms with Emma Stone's stuffed up teenager. The film almost feels like it has been done before, with all the trimmings to make us feel bad for the characters (particularly Stone's, with her twin dying by her 'fault'). It's many flaws may prove too much for some, but I really enjoyed this flick, mainly because it's exactly my type of thing. Jeff Daniels is good in the lead role, but his character keeps the stereotype that 'all writers go a little mad when they can't think of ideas to write about'. Emma Stone proves that she can do drama quite well, and can really carry an emotional monologue to make us feel for her. Lisa Kudrow is good, even though she's always Phoebe from Friends, but she really pulls off the role of the bored wife. Really, it's the imaginary friends who steal the show. 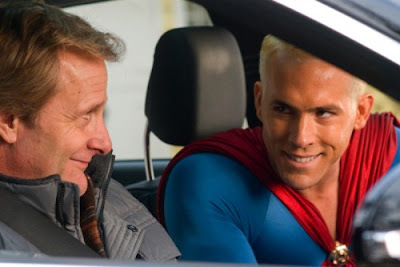 Ryan Reynolds has always been the kind of picture of a superhero, and seems to make fun of that image, especially with the outlandish costume and the peroxide blond hair. He serves as the comic relief of the film, which is good since the rest of it is quite depressing. Kieran Culkin, last seen as Wallace Wells in Scott Pilgrim vs. the World, plays the emo imaginary friend, and is fantastic being clingy and clinically depressed. Emma Stone isn't the only star on the rise, Culkin is too. THE VERDICT: It can be funny, it can be heart-breaking, but that doesn't make Paper Man perfect. The performances lift it from what it could have been.